This week at I/O, we were excited to announce some updates to Google Play to help you optimize your business on Google Play: to help you take control of your app publishing, gain insight into your users, and expand your app’s success globally. Many of you have invested in making great tablet experiences for your users, and we want to ensure that that work pays off and that users are able to discover great apps for their tablets. 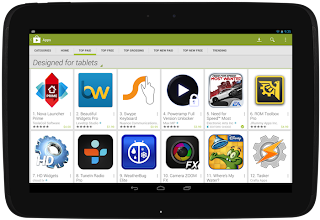 This week, the Google Play store began providing a view of our top charts highlighting apps which have been designed for tablets according to our tablet app quality checklist. Be sure you don’t miss out! Check that your app’s optimization tips say that your app is designed for tablets, and upload tablet screenshots for 7” and 10” tablets. We have introduced support for beta testing and staged rollouts so that you can get feedback on your new app or app update early in its development and make sure your users are happy with the results. You can test two different versions on two different groups at the same time, such as testing a newer version with your employees first, and a more mature version with a group of external testers. The beta testing is private on Google Play, and you can specify who gets these versions by adding Google Groups and Google+ Communities. Users give you feedback privately rather than through public reviews. When you’re satisfied that your new version is ready, you can now do a staged rollout to a percentage of your userbase. To give you more flexibility in light of beta testing and help get your whole team involved in the Developer Console, we will soon launch additional access controls. We’re collaborating with Google's internationalization team to make translating your app into new languages easier than ever. You can purchase professional translations of your apps from independent providers through the Google Play Developer Console. You can upload the strings you want translated, select the languages you want to translate into, and select your translation vendor based on time and price. If you’re interested in translating your apps with this feature, sign up to be a part of the preview in the Developer Console today on the APK page. 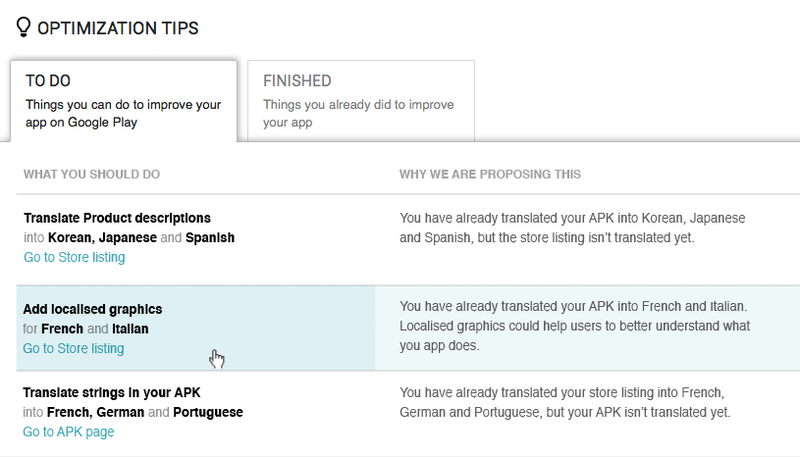 The new optimization tips for localization will help you identify new potential opportunities for global expansion based on popular languages for your app’s users and category. 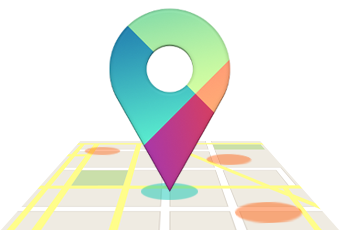 To fully localize your app into a language, you need to translate the strings in an APK, translate your Google Play store listing, and upload localized graphics. The optimization tips will also let you know if you’re missing any of these pieces. Getting better revenue and engagement data has been another key developer request, as developers told us that they check their revenue and stats constantly. New revenue charts in the Developer Console allow you to see your app’s daily revenue and summary figures, and you can filter the data by country. 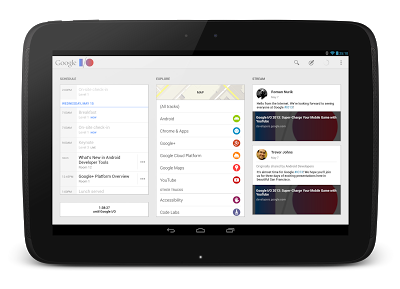 Coming soon, Google Play and Google Analytics are teaming up to bring you better insight into your users. Google Analytics will start showing Google Play views and installs for each campaign, while Google Play will show Google Analytics engagement metrics. For those of you using in-app billing, we’ve heard your feedback and made some improvements to reduce your development time and costs. Your test accounts will now able to make in-app test purchases without those transactions actually being charged, but everything else works the same as it would for a real user. In a few weeks, we will launch a new Order Status API, which allows you to verify the status of an in-app order from your servers. We will also be launching a tool for automating downloads of financial reports. Finally, the new Google Wallet Merchant Center is continuing to roll out with enhanced reporting, additional analytics and many other enhancements. You'll soon be able to offer apps to schools through Google Play for Education, which launches later this year to K-12 schools in the United States. This online destination will allow schools to discover, purchase, and distribute apps to their students. Visit developer.android.com/edu to get started creating or optimizing your apps for schools today. Today at Google I/O we announced a new IDE that’s built with the needs of Android developers in mind. It’s called Android Studio, it’s free, and it’s available now for you to try as an early access preview. To develop Android Studio, we cooperated with JetBrains, creators of one of the most advanced Java IDEs available today. Based on the powerful, extensible IntelliJ IDEA Community Edition, we've added features that are designed specifically for Android development, that simplify and optimize your daily workflow. We know you need a build system that adapts to your project requirements but extends further to your larger development environment. Android Studio uses a new build system based on Gradle that provides flexibility, customized build flavors, dependency resolution, and much more. This new build system allows you to build your projects in the IDE as well as on your continuous integrations servers. The combination lets you easily manage complex build configurations natively, throughout your workflow, across all of your tools. Check out the preview documentation to get a better idea of what the new build system can do. 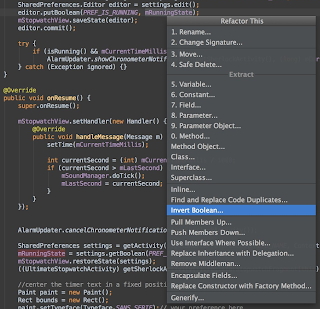 Android Studio includes a powerful code editor. It's based on the IntelliJ IDEA editor, which supports features such as smart editing, advanced code refactoring, and deep static code analysis. Smart editing features such as inline resource lookups make it easier to read your code, while giving you instant access to edit code the backing resources. Advanced code refactoring gives you the power to transform your code across the scope of the entire project, quickly and safely. 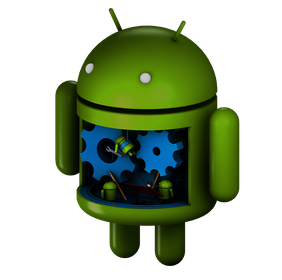 We added static code analysis for Android development, helping you identify bugs more quickly. 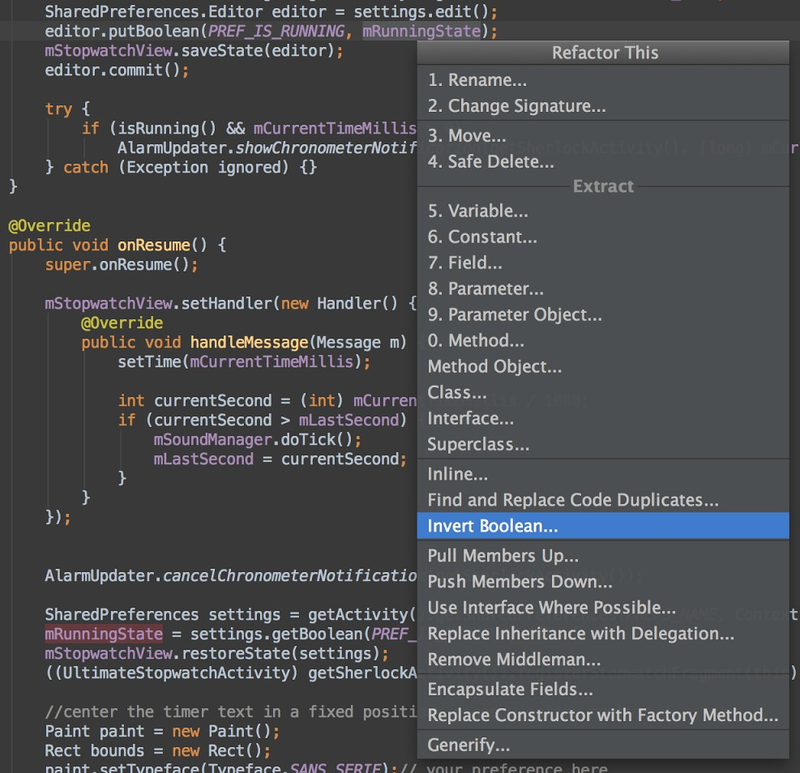 On top of the hundreds of code inspections that IntelliJ IDEA provides, we’ve added custom inspections. For example, we’ve added metadata to the Android APIs, that flag which methods can return null and which can’t, which constants are allowed for which methods, and so on. Android Studio uses that data to analyze your code and find potential errors. Over the past year we’ve added some great drag-and-drop UI features to ADT and we’re in the process of adding them all into Android Studio. This release of Android Studio lets you preview your layouts on different device form factors, locales, and platform versions. We wanted to make it easy for you to harness the power Google services right from your IDE. To start, we’ve made it trivial to add services such a cloud-based backend with integrated Google Cloud Messaging (GCM) to your app, directly from the IDE. We’ve also added a new plugin called ADT Translation Manager Plugin to assist with localizing your apps. You can use the plugin to export your strings to the Google Play Developer Console for translation, then download and import your translations back into your project. Give Android Studio a try and send us your feedback! It's free, and the download bundle includes includes everything you need, including the IDE, the latest SDK tools, the latest Android platform, and more. . 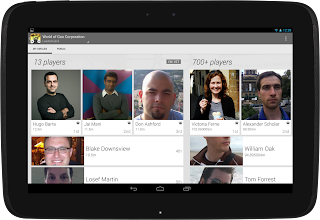 Note: This is an early access preview intended for early adopters and testers who want to influence the direction of the Android tools. If you have a production app with a large installed base, there’s no need to migrate your development to the new tools at this time. We will continue to support Eclipse as a primary platform for development. If you have feedback on the tools, you can send it to us using the Android Studio issue tracker. The last year has been an exciting one for Android developers, with an incredible amount of momentum. In fact, over 48 billion apps have been downloaded from Google Play to date, with over 2.5 billion app downloads in the last month alone. This week, at Google I/O, our annual developer conference, we’re celebrating this momentum, and putting on stage a number of new features and advancements both for the Android platform and Google Play, to help you design, develop and distribute great apps to your users. We just wrapped up the keynote, and wanted to share a number of those new features; we’ll be spotlighting some of them throughout the week both here, on Google+, and in 36 Android sessions and sandboxes at the Moscone center in San Francisco (with many of the sessions livestreamed at developer.google.com). Enjoy! Google Play Services is our platform for bringing you easier integration with Google products and new capabilities to use in your apps. 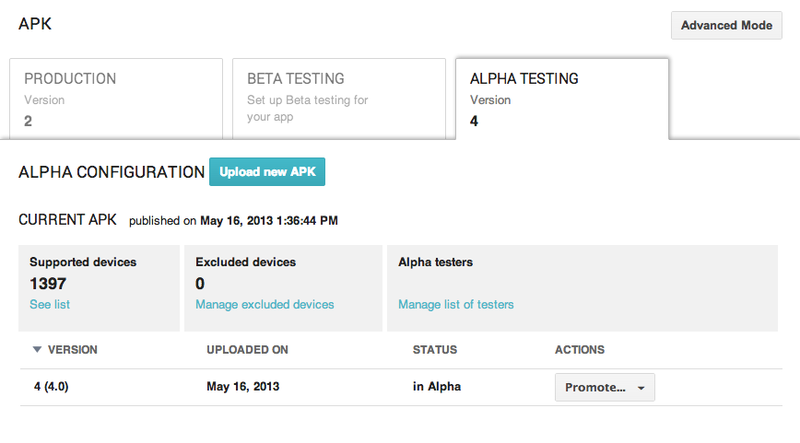 Today we announced a new version of Google Play Services that has some great APIs for developers. Cross-Platform Single Sign On, which lets your users sign in once, for all of their devices using Google+ Sign-In. Today we announced a new Integrated Development Environment (IDE) built just for Android, with the needs of Android developers in mind. It’s called Android Studio, it’s free, and it’s available now to try as an early access preview. 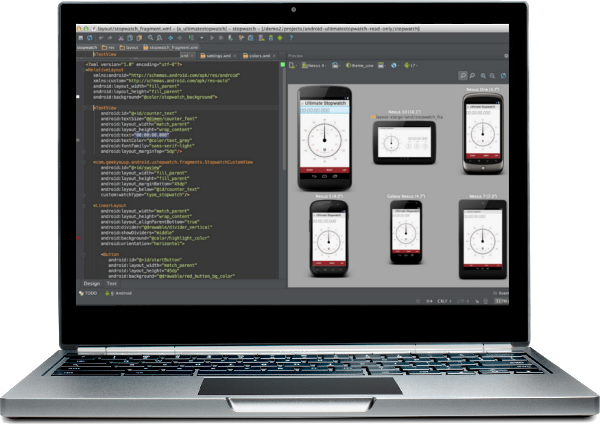 To build Android Studio, we worked with with JetBrains, creators of one of the most advanced Java IDEs available today. Based on the powerful, extensible IntelliJ IDEA Community Edition, we've added features and capabilities that are designed specifically for Android development, to simplify and optimize your daily workflow for creating Android apps. App translation service: a pilot program that lets you purchase professional translations for your app directly from the Developer Console. 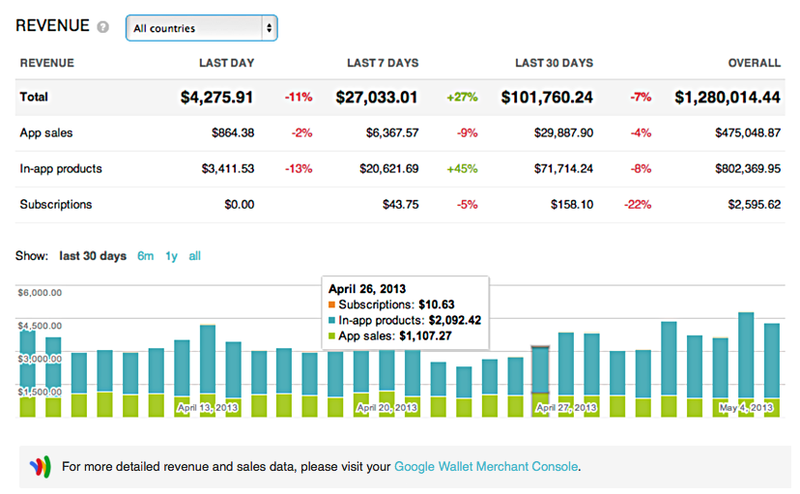 Revenue graphs: a new tab in the Developer Console gives you a summary of your app global app revenue over time. Alpha and beta testing and staged rollouts: you can now distribute your app to controlled alpha and beta test groups, or do staged rollouts to specific percentages of your userbase. 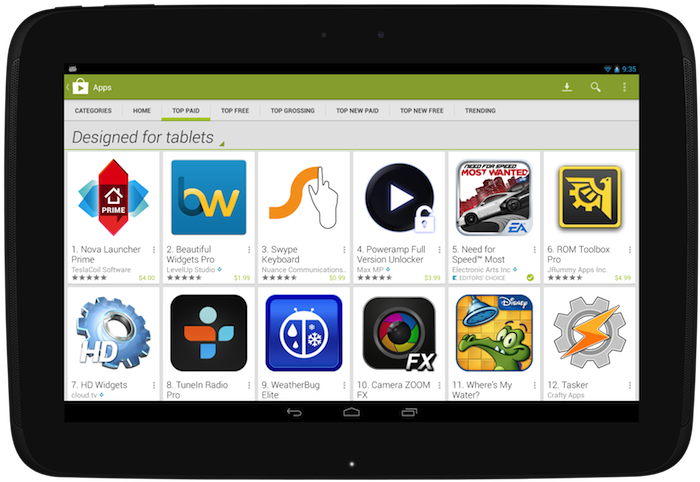 Optimization tips: design your app for tablets and understand how to expand your app into new language markets. Google Analytics: launching later this summer, your Google Analytics usage stats will be viewable right in the Developer Console. Referral tracking: also launching later this summer, you’ll get a new report in Google Analytics to show what blogs, campaigns, and ads are driving your installs. Join us for the Android sessions today and through the week by livestream. 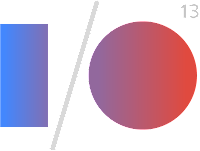 Visit the I/O Live Stream schedule for details.